It seems fitting that an astrophysicist from the University of California San Diego, a location associated with sunny days, contributed to an important cosmic breakthrough around the discovery of a cloudless planet. Burgasser, who previously studied clouds in the low temperature atmospheres of stars and brown dwarfs, was a coauthor on the article. He contributed to the interpretation of the observations while he was in residence at the University of Exeter as a Fulbright Scholar this past fall. Using Europe’s 8.2m Very Large Telescope (VLT) in Chile, the team studied the atmosphere of WASP-96b when the planet passed in front of its host-star (Figure 1). This enabled the scientists to measure the decrease of starlight caused by the planet and its atmosphere, and thereby determine the planet’s atmospheric composition. Just as fingerprints are unique, atoms and molecules have specific spectral absorption patterns that can be used to detect their presence in celestial objects. 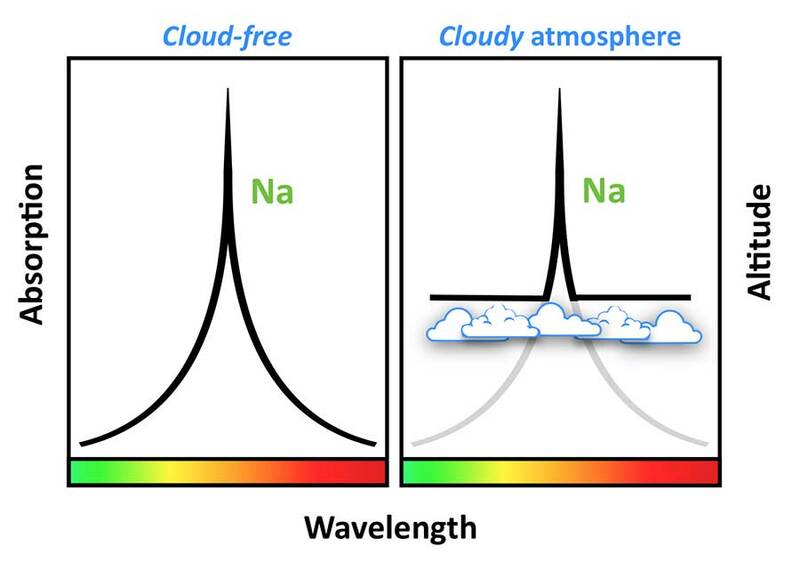 The spectrum of WASP-96b shows the complete fingerprint of sodium—the seventh most common element in the universe—which can only be observed in a cloudless exoplanet atmosphere (Figure 2). The observation allowed the team to measure how abundant sodium is in the atmosphere of the planet, finding levels similar to those found in our own Solar System. It has long been predicted that sodium exists in the atmospheres of hot gas-giant exoplanets and, in a cloud-free atmosphere, its highly broadened line produces a spectral pattern similar in shape to the profile of a camping tent. WASP-96b is a typical 1300 ºK (1030 ºC, 1880 ºF) hot gas giant, similar to Saturn in mass and exceeding the size of Jupiter by 20 percent. The planet periodically transits a Sun-like star 980 light years away in the southern constellation Phoenix, halfway between the bright southern jewels of Fomalhaut (α Piscis Austrini) and Achernar (α Eridani). According to co-author Ernst Ernst de Mooij from Dublin City University, WASP-96b will also provide scientists with a unique opportunity to determine the abundances of other molecules, such as water, carbon monoxide and carbon dioxide, with future observations. The team plans to look for signature of these molecules with the Hubble and James Webb Space Telescopes, as well as telescopes on the ground. At UC San Diego, we are changemakers. Recognized as one of the top 15 research universities worldwide, our culture of collaboration sparks discoveries that advance society and drive economic impact.